We are preparing the Electrical Panel Schedule in Revit. 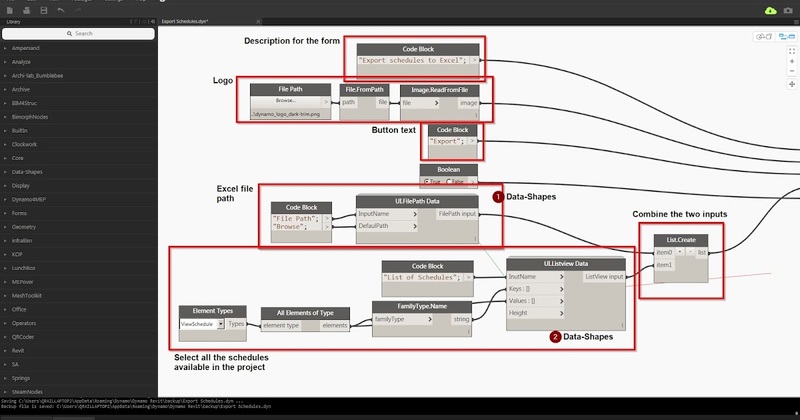 Is there a way to export those schedules to excel using dynamo and make modification then bring it back? Please read these posts carefully. To a start, become familiar with searching the forum and reading what previously has been done. Thank you very much for reminding me of the guidelines.I will try to follow it as much as i can. hello, Did you find any solution yet ? This particular topic of Revit to Excel and then back to Revit has been covered a lot in post here and elsewhere. I reccomend that you try something out and post back if you get stuck. @JacobSmall I’m not sure if it has as Panel Schedules are not component schedules, and have their own methods that differ from ViewSchedule’s. I’ve only recently implemented Panel Schedule support to BimorphNodes Schedule.GetData node (in V2,1). @Ahmed.Elmahdy if that is what you are referring to, then it is possible to export Panel Schedules to Excel, however you will need to code it yourself or wait until BimorphNodes v2.1 is released to do it. There are methods in the API to write data to Panel Schedules, but as far as I’m aware, this functionality has not been exposed in any package so you would need to code this yourself. There are other complications as well, since Panel Schedules comprise a Header, Body and Footer, all of which can accept values, but the cells are automatically merged resulting in differing numbers of cells per row and this which makes writing data to a from Excel more complex. Thanks @Thomas_Mahon I’ve searched before and i know if there is a way to do that it will be very difficult because panel schedules is more complicated than quantity schedules. I was trying only with element schedules it worked. Then one of my colleague was pushing me to check for Panel schedules, i was hesitant to try. Then, with the same script i changed the category and it worked. Here is my script for the Panel Schedules. Thank you Thomas. I was able to export it. There are few data which gets missed. Please refer the snapshots. @ashanmugam I cant replicate this problem. Have you refreshed your data? If so and it still doesn’t show, upload a simple example file which can be tested. @ashanmugam thanks for the sample file. Unfortunately this looks like a bug in the Revit API as the schedule footer is incorrectly reporting only 4 cells (2 rows and 2 columns) when there are clearly more than that. I’ve attempted to index the cells beyond these numbers, but unsurprisingly, it fails. In testing before v2.1 release, I did notice other anomalies when accessing data from an Electric Panel Schedule, such as indexing failures even when the reported rows and columns indicated they were within range, so I decided to bypass these problem area’s and it seemed to be acceptable when checking if there was any loss of data (for the most part, there wasn’t any). The only option is to get Autodesk support to investigate and confirm the cause as there appears to be no solution through the API. Thanks Thomas, i was able to export my schedule into excel even though there are still some items that are missing but its all good but after my 2nd try of exporting the excel file is empty and dynamo is showing some errors/warnings. any idea how to fixed this?